W is the very antithesis to the softer, gentler, new age man. As comes as part of the whole côte de boeuf-chewing, Montecristo-chomping, and Macallan-swirling package - the very red-blooded alpha-ness of which, very frankly, doesn't bother me in the least - he's, unsurprisingly, not terribly keen on vegetables. But if you were to ask him, he'll have you know that that's a false accusation - hey, aren't mashed potatoes, french fries, and gratin dauphinois three of his favourite things? Of all the vegetables he's not terribly keen on, the carrot is anathema. But I exaggerate. He will do the occasional Carottes Vichy - which, of course, is more about the taste of great butter than the taste of carrots. And it amuses me to no end that he loves carrot cake. So much so, in fact, that it ranks as my most frequently used means of sneaking carrots into our diet. I'd earmarked a pretty spectacular-looking/sounding recipe from Boulevard: The Cookbook by Nancy Oakes and Pamela Mazzola as a special treat to attempt for some time now and finally found the time and energy to give it a go. Like many of the other recipes in the book, it's a multi-component extravaganza that, if you're painfully slow like me, is probably a weekend project. This dramatic makeover of a beloved classic from homey to haute will appeal to anyone who believes that "the simple truth is carrot cake is our favourite excuse to eat cream cheese frosting" (as Nancy Oakes puts it). Here, thin, multiple layers of cake are filled with cream cheese frosting so each and every bite boasts the perfect cake-to-frosting ratio. The cake is accompanied by scoops of candied walnut ice cream, cream cheese ice cream and carrot sherbet, and finished with a sticky drizzle of walnut caramel and strands of candied carrots. Time-consuming? Yes. Otherwise, each individual component is not in itself difficult to make (but because the cake is so moist, the trickiest bit comes when splitting the cake layers). Worth the time and effort? Absolutely. 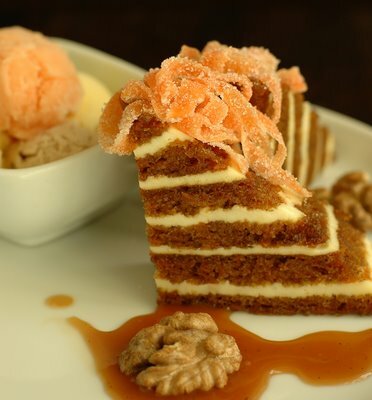 Never knew carrot cake could look this gorgeous ! I'm a fan of the Boulevard cookbook--the chocolate cherry shortcakes...mmmmmmmm...can't wait for Bing cherry season! My God, this looks stunning.The things you present here.. These look wonderful and I am sure taste great too. YUnbelievable presentation. I definitely admire your patience. I've never seen a multi-layered cake like this. And candied carrot strips - I can't imagine what they're like. Though I only ate orange food as a kid, this is a new one for me!? Che meraviglia, peccato non ci sia in italiano!! That looks so good! I love carrot cake, specially with walnuts! Wow - this looks great. Definitely a labour of love for your DH! love your work and your fantastic blog, especially the detail in this carrot inspired dessert. Great Job! Who would've thought the humble carrot cake could be dressed up to become the belle of the ball? Simply stunning! I've been reading your blog for quite some time...I am very impressed! I love to bake as well, and especially love carrot cake. A couple months ago I bookmarked this particular carrot cake recipe for "someday"...yours looks awesome! What a lovely looking carrot cake J. Such a beautifully done presentation! and yet again your artistry and technical skills amaze me. indeed, who knew that carrot cake could look so haute! this may be the most beautiful carrot cake I ever saw in my life...well i'm still pretty young but the picture is tempting me even if I am not a big fan of carrot cakes. Should try your to change my mind! It kills me that I cannot eat this dessert right now! I would pay (almost) any price. Carrot cake is my FAVORITE. You just do such a stunning job with presentation, too, Jocelyn. You inspire me to challenge myself more. I would like to get that recipe and do the cake/icing component, the candied carrot and the caramel. 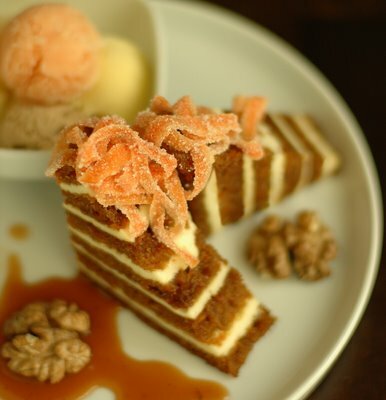 words can't even begin to describe the beauty that is this carrot cake! bravo for spending so much time [and being so patient!] to cut each little layer. Wow... that is so gorgeous. I love the ration of cream to cake. i always wonder who on earth thought to make cake from carrots... 99% of the time its bad. im sure yours is great! i just saw the recipe in the magazine titled Desserts from America's Top Chefs that came out this month. It truly looks delicious! can backfire on you and get you the opposite result of that which you hoped for. or doesn't like it. Hint around and ask her what types of fragrances she likes and dislikes. Everything is gorgeous in your blog? wahou.......are you a professional? It's amazing I love your photos and I love truffles too !!! I just made this! It's the first recipe I tried from Boulevard too! =) (Of course my attempt wasn't quite perfection the way yours was!) And it was ridiculously good. I didn't bother with the sorbets though. You're amazing!